Yemen's Houthi Rebels Dissolve Parliament, Seize Power : The Two-Way A televised statement said the group was forming a presidential council that would run the country. It called the takeover "a new era that will take Yemen to safe shores." 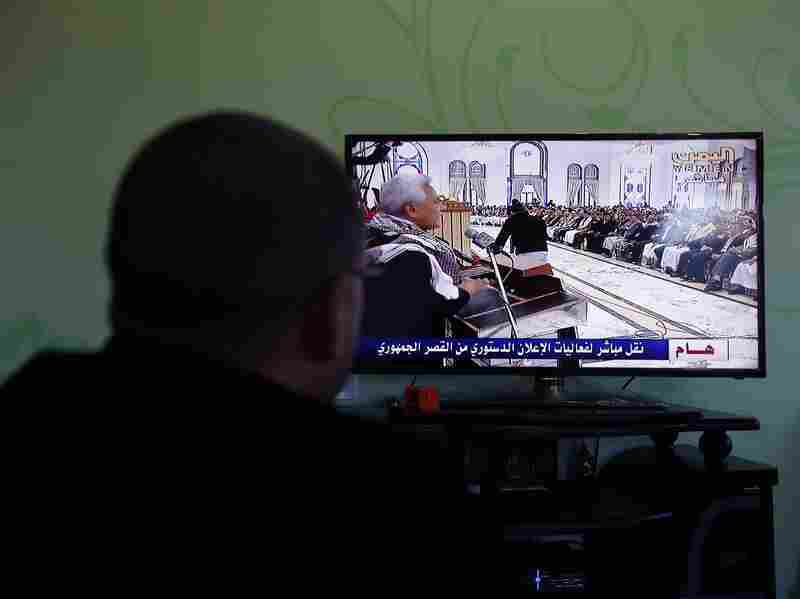 A Yemeni man watches a gathering on television organized by the Houthis announcing their vision for Yemen's government in Sanaa, Yemen, on Friday. Yemen's Shiite Houthi rebels announced today they are dissolving parliament and taking over the country, cementing a seizure of power that began last September. A televised statement read by an unidentified Houthi member called the takeover "a new era that will take Yemen to safe shores." He said the group was forming a 151-member presidential council that would act as a government for two years. Revolutionary Committees would be in charge of forming a new parliament, the statement said. "The development also plunges the impoverished country deeper into turmoil and threatens to turn the crisis into a full-blown sectarian conflict, pitting the Iran-backed Houthi Shiites against Sunni tribesmen and secessionists in the south." Today's developments are the culmination of weeks of instability that began Jan. 20 when the Houthis shelled President Abed Rabbo Mansour Hadi's house and seized the presidential palace. Two days later, Hadi, his prime minister and Cabinet all resigned amid pressure from the rebels to, among other things, make some key appointments, which the president rejected. But the seeds of the conflict were sown last September when the Houthis reached Sanaa. Hadi's government and the rebels negotiated a deal that allowed the Houthis to control parts of the capital. The Houthis follow a strain of Shiite Islam that is close to the dominant Sunni strand of Islam. Yemen, which is predominantly Sunni, is a key U.S. ally in the war on terrorism. The Houthis are avowedly anti-U.S., but are also battling al-Qaida in the Arabian Peninsula, regarded as the most successful al-Qaida franchise. The Houthis, who were created as a movement in 2004, want greater autonomy for the north of Yemen and for the past year have pushed south toward the capital, Sanaa, capturing territory. Despite the lack of clarity on who is in charge in Yemen, the U.S. has continued its drone strikes against al-Qaida targets in the country.